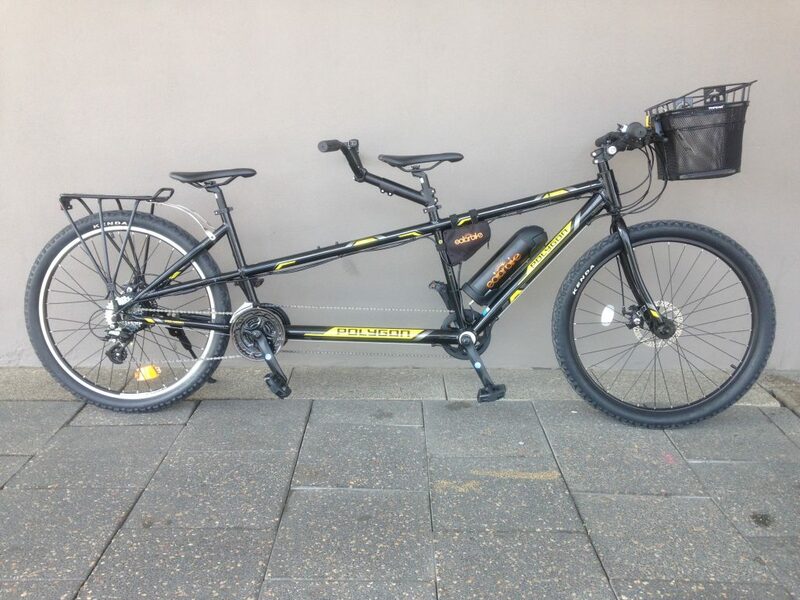 The custom electric Polygon tandem is one of the best ways to enjoy a two person ride. The captain up front has full control of the bike and gears including the electrics, this leaves the stoker (rear passenger) to only assist in pedaling. The new 27.5″ wheels improve the durability of the tandem and can take the forces of two riders and the electric motor opposed to the weaker 700c versions. Additionally, the wheels offer a lower stand over height, paired with adjustable stems and seat posts meaning that it can suit almost any rider, young or old. The drive train is SHIMANO Altus 24 speed which is good for most terrain but matched with a electric SOLARBIKE rear hub motor and battery is more than capable of the steepest hills. Overall the electric POLYGON tandem is a fast, comfortable and reliable way to ride together and be enjoyed by everyone.